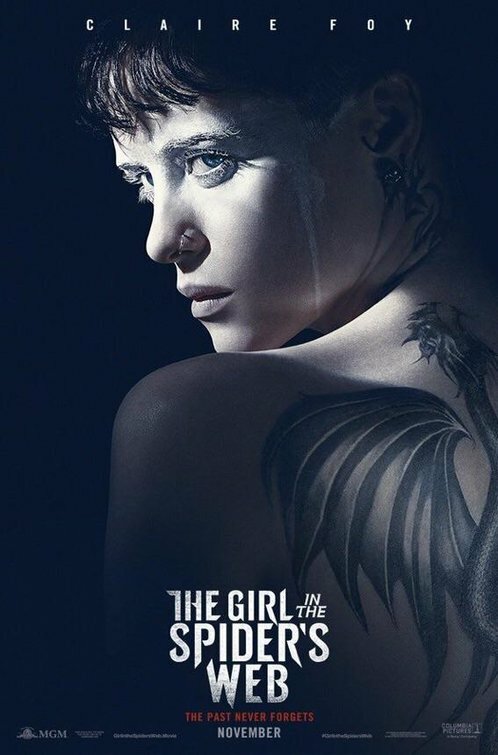 Review: When 2011’s U.S. remake of the 2009 Swedish phenomenon The Girl with the Dragon Tattoo failed to bring in the kind of audience Columbia Pictures and MGM was hoping for, the two planned sequels were put on an indefinite hold. What a pity. Though the remake had its share of detractors, it was a compelling mystery and expertly made film that took its time to explore the characters and wasn’t afraid to wallow in some dark material. Director David Fincher is a master at what he does and the look and feel of the movie, not to mention the fantastic performances from Rooney Mara (who received an Oscar nom for her work) and Daniel Craig, has helped to keep the film a singular experience. Deciding to skip the two direct sequels and start over with a new novel released in 2015 brought a challenge. With Fincher, Craig, and Mara all released from their contracts and on to different projects, when the time came to bring the franchise back to life for The Girl in the Spider’s Web the studio had to go back to the drawing board and find a new director and star. Bringing on rising director Fede Alvarez (Evil Dead) and hiring Claire Foy (Breathe) as the titular character were impressive gambles that don’t completely pay off. The resulting film works fine as a standard thriller if you didn’t have any previous knowledge of the characters but as a continuation of what Fincher started back in 2011 (and what really began with the original film trilogy in 2009) it misses the mark by a longshot. It’s been three years since the events of The Girl in the Dragon Tattoo and computer hacker Lisbeth Salander has become a not-so-secret vigilante of sorts in Stockholm, coming to the aid of women wronged by men. The opening of the film (spoiled, like much of the movie, by trailers that have given away far too many key plot points) finds Salander giving a wife beater a bit of sweet vengeance. Foy plays the exchange like she’s buying carpet for her rec room at IKEA, it’s fine to be emotionally removed from these abusers but her monotone delivery suggests boredom rather than detachment. Salander’s ally Mikael Blomkvist (Sverrir Gudnason) hasn’t seen her since her wrote an exposé centered on her family. Though his editor and sometime lover Erika (a sadly underused Vicky Krieps, Phantom Thread) urges him to move on, he can’t forget the troubled girl. Much like Fincher’s film, Alvarez keeps Lisbeth and Mikael apart for a good half of the film but unlike the previous entry when they do share screen time there’s next to no spark between the two. That’s partly because the dynamic in this movie feels like it’s shifted and Mikael is now more of a second banana to Lisbeth’s main character. When Lisbeth is asked to retrieve a computer program that becomes a threat to the national security of America and Sweden, she’s thrown into a conspiracy that will bring her back to painful memories (and people) of her childhood. If you’ve read the book The Girl in the Spider’s Web is based off of, be prepared for major changes. For fun, after the screening I read the plot synopsis of the novel and was amazed at the liberties screenwriters Alvarez, Jay Basu, and Steven Knight took with David Lagercrantz’s original text, rendering it almost wholly new. For what it’s worth, the novel sounded far more muddled and complicated, something that wouldn’t have translated easily to the screen. That leaves Alvarez to cut his own course with the material, leaving out the connective tissue that helped make The Girl with the Dragon Tattoo such an intriguing mystery. There’s no real thought process from anyone in the movie, they either just “know” the answer to a perplexing puzzle or whatever methods they use to figure things out happen offscreen. One example is a character in the U.S. who is trying to locate a hacker by tracing their location. The location is narrowed down to Stockholm, at which time the character grabs his coat and runs directly to the airport…because Stockholm is so specific. Part of what makes these kind of films fun is playing detective alongside our lead characters but here we are so far removed that it’s like someone is reading us a story instead of inviting us to follow along. The screenwriters also make a giant leap in turning Lisbeth into more of a superhero than a heroine. She takes a licking and keeps on ticking, bouncing back from explosions and beatings needing little to no recovery time. One moment Lisbeth has been drugged and the next she’s snorted some crushed opioids and is driving a car in pursuit of cybercriminals. She also has a curious knack for knowing the right way out of dead end. 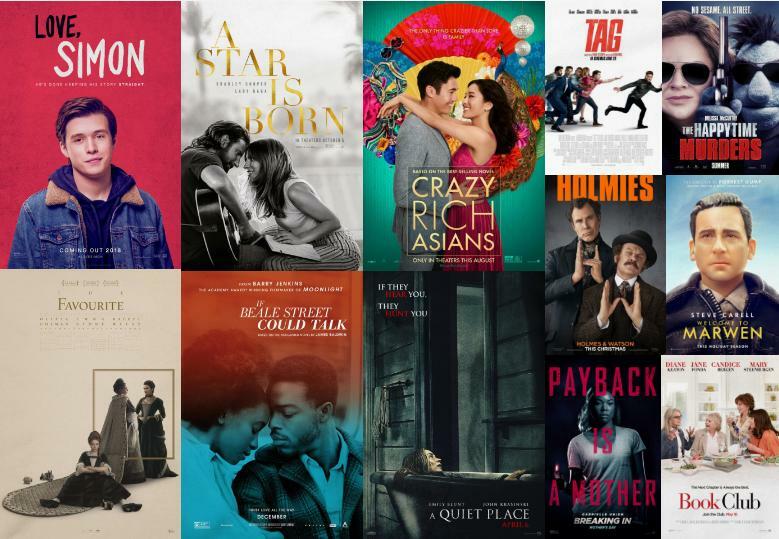 I’ve enjoyed Foy in her films so far in 2018. She was great in the paranoid thriller Unsane and good in October’s First Man. Here she’s merely OK and it’s mostly due to her being miscast as an edgy character lacking bite. Mara and her Swedish counterpart Noomi Rapace played Lisbeth as damaged goods, alternately withdrawn and feral which led to her being unpredictable. Foy isn’t afforded much in the way of surprise so we’re just tagging along for what is largely an unremarkable ride for the actress. As a jumpy NSA agent on Salander’s trail, Lakeith Stanfield is even more of an enigma. There’s no backstory to his character by way of an introduction nor do we get any blanks filled in along the way. We get a sense he’s good at his job but how spectacular can he be if he’s constantly bested by Salander and the thugs on her trail? By the time he’s somehow called on to be an expert marksman in an admittedly nicely constructed action scene, I sort of stopped asking questions. The best performance in the whole film is Sylvia Hoeks as a ice blonde specter from Lisbeth’s past. Dressed head to toe in red and never speaking above a child-like purr, she’s intimidating without even raising a finger. It does veer toward campy Bond villainess at times (the whole film feels like a gender-bending Bond romp, actually) but Hoeks knows exactly what film she’s in and sinks her teeth into every bit of scenery she can get her hands on. Much like she did with her unsettling character in Blade Runner 2049, she becomes the focal point of any scene she’s in. Alvarez shows off some style in his eye for imaginative camera angles with the help of cinematographer Pedro Luque (Don’t Breathe) and slightly macabre visuals but he is far more restrained than he was in previous films. Aside from one rather ghastly sight of a man missing a key piece of his face it’s relatively tame. I appreciated that he included a brief title sequence, nicely echoing the unforgettable pulse-pounding nightmare credit sequence of the first film. The music by Roque Baños (In the Heart of the Sea) helps to set the mood, even if that mood too often requires Baños to veer into action movie histrionics. I’m not sure what the impetus was for the studios to revive this franchise again in 2018 (were they about to lose the rights?) but they’ve given us another chapter in the Dragon Tattoo collection that doesn’t even feel like it’s in the same universe as what’s come before. The characters deserve better, the actors deserve better, we deserve better. Thoughts: Though 2011’s American remake of the Swedish sensation The Girl with the Dragon Tattoo was well received by critics (earning an Oscar nomination for star Rooney Mara in the process), it didn’t do the kind of box office numbers that inspired Sony Pictures to keep the franchise going. 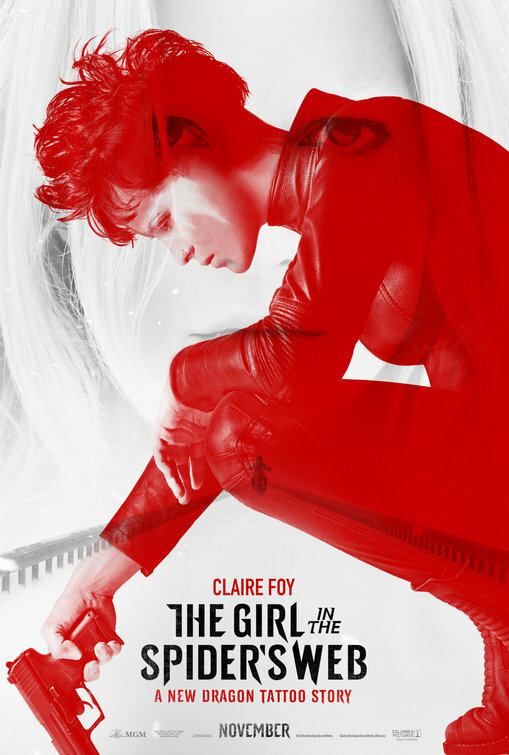 When a continuation of the original trilogy of novels was released, the interest in resurrecting the computer hacker heroine grew which is why we’re now getting an all-new take on Lisbeth Salander in The Girl in the Spider’s Web. With Claire Foy (Breathe) taking over for Mara and Fede Alvaraz (Don’t Breathe) assuming directing duties from David Fincher, this first look suggests the same dark vibe as the previous entry. Foy looks to have morphed nicely into the rough and tumble Salander and I’m excited for Blade Runner 2049 breakout Sylvia Hoeks to be featured briefly in this teaser.